Climate change is one of the most pressing challenges facing our world today, and as religious leaders representing diverse faith traditions we are called to reaffirm our commitment to be responsible stewards of Earth’s resources and to act in love toward our neighbors both locally and globally. Scientists, including those representing 28 Iowa colleges and universities who recently released a statement, have warned us that changes in global climate patterns are bringing more extreme weather events to Iowa, the United States, and our world. These events include droughts, extreme temperatures, floods, storm surges, and wildfires. These changes threaten our environment, our health and safety, our economy, our agriculture, and our security. They also raise fundamental questions of justice and fairness, as those who are least able to adapt to climate change and who contribute least to the problem are likely to suffer the worst consequences. As people of faith, we are called to take responsible precautionary action to limit global climate change to the fullest extent possible and to prepare now for the climate impacts that are unavoidable. There are many actions that can be taken by individuals, families, congregations, businesses, local communities, and the state to reduce the threat of global climate change, such as reducing energy use in our homes and vehicles and using renewable energy sources. We urge Iowans to take such actions. The global nature of the problem, however, means that effective action requires leadership at the local, state, and national levels to form policies and strategies that address responsible energy use to ensure that we protect Earth and its most vulnerable populations from the significant threats posed by global climate change. We call upon people of faith to provide leadership on this issue and act in the interest of the common good. *The listing of faith community names is for identification purposes only. The Church of the Brethren, my religious tribe, which I sometimes refer to as being kind of like liberal Amish, has a bit of an heirloom streak – an impulse to restore and preserve what is believed to be a more perfect past. In contrast, my theology and view of scripture and the church has become more hybrid or mixed in nature. I now see God working not so much at the center of groups, where sameness and familiarity tends to rule, but more on the edges of groups, or even in the space between, where different kinds of persons and cultures meet. I grew up in a racially mixed family in, otherwise, all white Grundy County, Iowa. The derogatory and racist comments I heard as a child, from the mid 1960s, about my Korea-born brother and sister, cured me of any purity streak I might have entertained. Then, as a young adult, I, from a long line of Brethren farmers and preachers, fell in love not with a Brethren woman, but a Christian Church (Disciples of Christ) woman. But curiously, when I told my mother this woman’s name and her parent’s names, all my mother said was, “That’s very interesting.” And when Mary Jane told her dad the same, his response was an identical, “That’s very interesting.” Then we discovered her dad and my mom, over several years, and unbeknownst to us, had been meeting on a regular basis in Des Moines, respectively as the Church of the Brethren and Christian Church (Disciples of Christ) representatives on the Board of Directors of the Iowa Inter-Church Forum. I have experienced the awful distortions of God and scripture and church when one group says to another “I have no need of you.” But where strangers become brothers and sisters and where a new family is created from different backgrounds, there I see wonder and beauty and hope for the future. 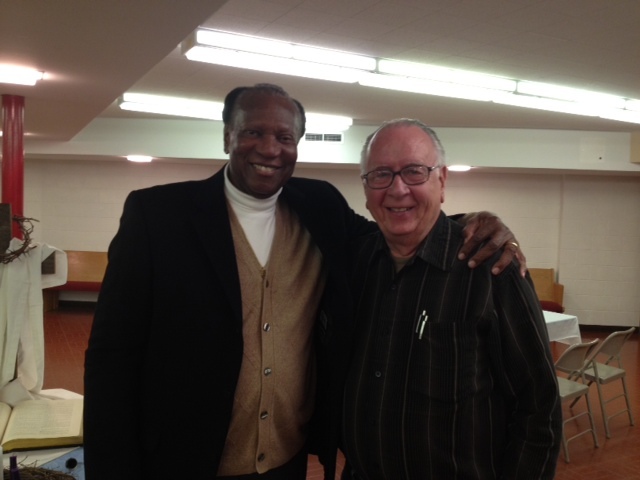 This personal reflection was shared on March 20, 2012 at the Ankeny Forum, an ecumenical gathering of Central Iowa ministers at Resurrection Lutheran Church, Ankeny Iowa.